Brew your American Pale Ale or IPA with these great all-around Cascade hops. Enjoy a pleasantly smooth grapefruit, citrus-y flavor with a hint of floral aroma. This is the one to keep on hand for using with American hops, British hops and SAAZ. It's one of our best-selling hops. Tettnang variety is a very fine traditional aroma hop, well established in the European Lager type beers. Has also been used successfully in traditional lighter English cask ales. The classical “noble” aroma hop with long and strong traditions. Associated with the renowned Pilsner lager. The predominant Czech variety. Development: Czech aroma landrace variety. A true dual purpose hop. Bred in England and later grown in Belgium, Spain, Germany and the US. 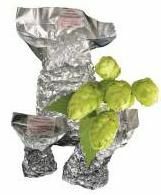 Development: One of the original high alpha hops bred in England; a cross between an American wild hop and English male. At one time, the major Hallertau landrace variety with a highly acclaimed aroma profile. Development: Traditional local variety in the Hallertau region.